NETWORK UPDATE: There were 0.1 bumps for BIG BROTHER and MASTERCHEF in final numbers, as well as for the reruns of BLACKISH and AMERICAN NINJA WARRIOR. BULLSEYE, though, lost 0.1. CABLE HIGHLIGHTS: DUCK DYNASTY led Wednesday cable with a 0.87 season premiere, followed by 0.43/0.40 for the 2-episode premiere of COUNTRY BUCKS. After a 0.61 lead-in from the season premiere of SUITS (down 0.14 from last June’s premiere), USA’s MR. ROBOT debuted with an OK 0.46. USA would undoubtedly like it noted that the pilot had been available for weeks online and on VOD, which may have dented the on-air number. On HGTV, BROTHER VS BROTHER lost 0.07 to 0.60, and HOUSE HUNTERS fell 0.04 to 0.43, with HOUSE HUNTERS INTERNATIONAL down 0.07 to 0.35. BET’s THE GAME dropped a tenth to 0.53, and lead-out FRANKIE & NEFFE fell 0.08 to 0.26. The highest-rated sports telecast was ESPN’s coverage of the final game of the COLLEGE WORLD SERIES at 0.50. 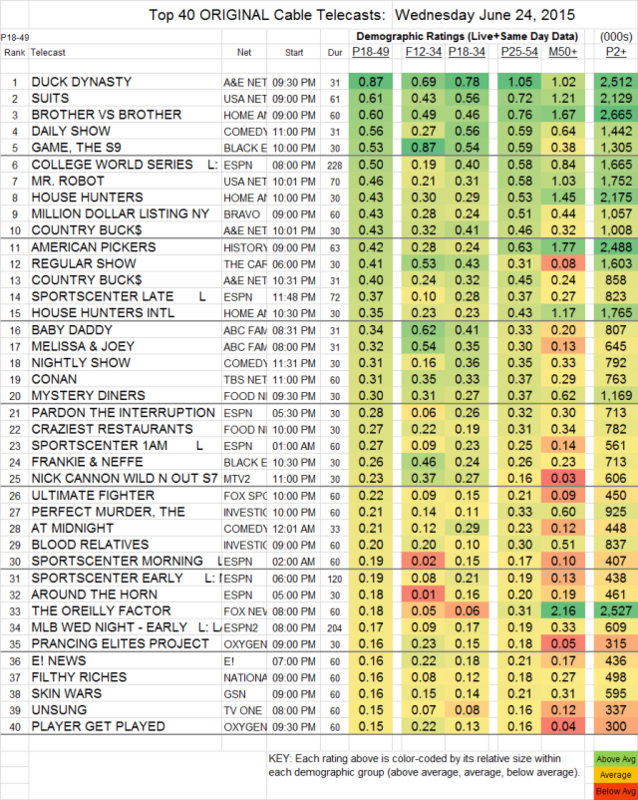 Bravo’s MILLION DOLLAR LISTING NY gained 0.04 to 0.43. On History, AMERICAN PICKERS lost 0.02 to 0.42. The ABCFamily pair of BABY DADDY and MELISSA & JOEY were at 0.34/0.32, respectively up 0.04 and down 0.05. NICK CANNON’S WILD N OUT (MTV2) dropped 0.11 to 0.23. The DAM Report: the 9PM airing of IMPACT WRESTLING was up 0.03 to 0.12 in 18-49s and up 22K total viewers to 369K, with an additional 0.03/82K for the midnight re-airing (steady in the demo, down 20K in viewers). RING OF HONOR was up 0.02/13K for its 8PM airing at 0.05/185K, and up 0.01/45K at 11PM with 0.04/145K.